Besides deposit, redeem and transfer transaction, FasaPay provides Referral feature. Tell your friend, colleagues or family to join FasaPay and get the commission each time they do transfer. When you reference people to register in FasaPay under your referral url (next will be called downline), you will get 10% of their transaction fee (only transfer service). Your downline sends fund to Broker X 100$. So, the fee will be 0.5% x 100$=0.5$. And your commission will be : 10% x 0.5$ = 0.05$. The page will be shown like this. You will see your commission balance and your referral url. Copy the referral URL to your friend/colleagues. 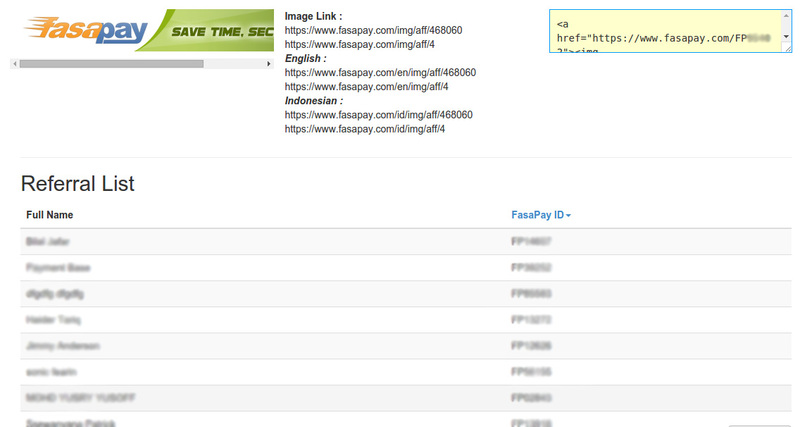 Or also, you can place FasaPay banner by pasting the html code in your website or blog. So, when someone register via that link, automatically, they will become your downline. Total commission is the commission you receive until now. commission ready to withdraw is the commission you haven't withdrawn. To withdraw to your account, minimun amount is 10.000IDR or 10$. Commission Ready to Withdraw will be send to your account once you click the “Send to Account” button. The process of commission withdraw is manual by our admin in our work hour. The transaction history of commission withdraw will appear in Transaction > Transaction history as deposit (with reference number Tuxxx). Finish means the commission has been added to your FasaPay balance. You can see your referral list in the bottom of the page. You can see their name and their FasaPay account number. Make sure they register under you referral url. Because system will add it automatically. And if they have registered and not under your referral url, you cant claim them. Your commission won't disappear although you dont withdraw it for a long time.